Are you ever out running errands or shopping, see an item in a store, and think, “hey, that would make a great gift for ______ …?” It definitely happens to me. The problem is that I pretty quickly forget about that great idea and when the intended recipient’s birthday or Christmas rolls around, I’m in a cold sweat, trying to figure out what to get them. 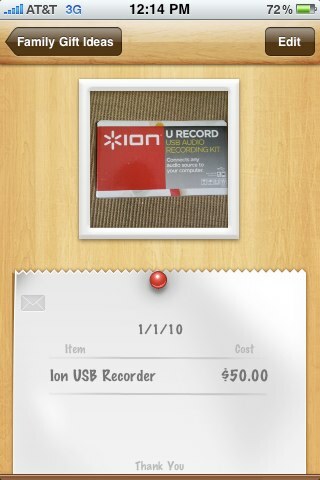 Just before Christmas, Zicron Software released Gift Box, an iPhone application intended to help folks like me stay organized at birthday and holiday times. 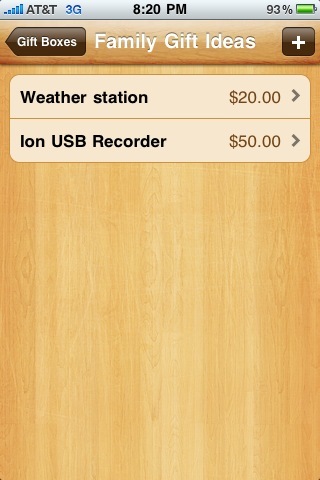 Zicron Software is still pretty new to the world of iPhone apps. Gift Box is their second iPhone product. We reviewed their first, Years, a while back. Like Years, which performs a simple function that should have been included in the iPhone at the beginning, Gift Box is an uncomplicated and aesthetically pleasing program. The app contains just a few screens. 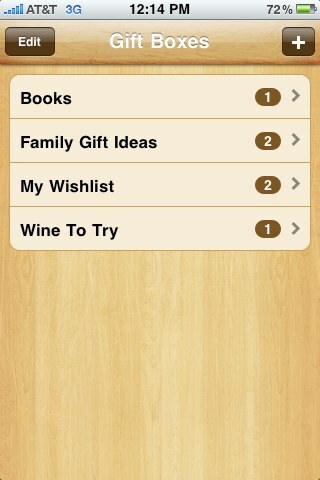 The first screen contains your lists, or “gift boxes,” as the software calls them. You can create a list of ideas for individuals to whom you are storing gift ideas, or for an event. Selecting one of the gift boxes will show you a list of the ideas you’ve already stored. Tapping the “+” button in the upper right-hand corner will create a new item. The new item screen allows you to capture information about the store where the item was seen (or is available), the name of the item and the cost, any additional notes you want to take, and a photo of the item. You can also add up to three stars to help you prioritize your ideas. Adding a photo for an item is easy. Gift Box has the ability to take photos from within the app and also allows you to do basic photo editing (cropping and centering) to help best capture the image. Once you have recorded and saved an item, you can email it from within the app by selecting the mail icon that appears in the upper left corner of the item note section. What Needs Improvement: The aesthetics of the app are really nice; however, as you may notice in the image above, the light colored font used in the item view can be difficult to see. A slightly darker font would be nice. 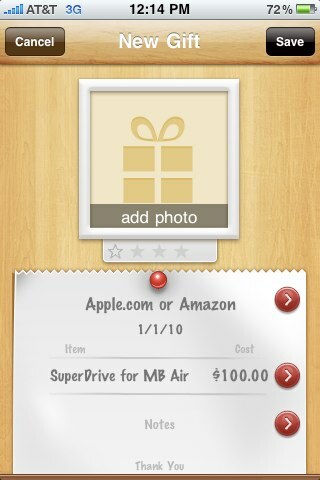 MSRP: Gift Box is available in the iTunes store here for $0.99. Jeff’s interest in computers and technology began by watching too many Star Trek reruns after school. His first computer was a Timex-Sinclair, for which he had the 16K – yes, 16K – add-on pack. His current interest in gadgets was spurred on by the original Palm Pilot; from there it was a slippery slope to Pocket PCs, Archos media players, Sony Cliés, and various Apple products.